On another visit, we ended up like this, with Little Arrow trespassing on Her Majesty's front garden. 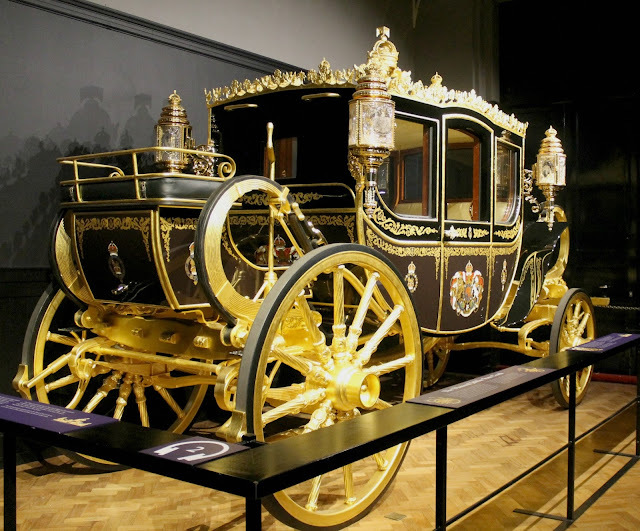 Needless to say, I was due for some adult time at the Palace, and that's just what I got a few weeks ago when a group of girlfriends and I went down to London for a day of touring the State Rooms, the Royal Mews, and the Queen's Gallery. I wrote a description of the experience over at Anglotopia as well, but here are a few other highlights and photos. First, the Royal Mews is not to be skipped, as I almost foolishly suggested to our pressed-for-time group. (For those not well versed in posh royal terminology, the Royal Mews is where the carriages, horses and fancy cars are kept). Because it's open almost year-round, unlike the State Rooms, it is far more accessible to visitors than the Palace itself. It's also the spot I'd be most apt to return to with my boys. I think they'd find the horse stables, carriages and facility interesting. Personally, I loved this glimpse into royal life that the Queen herself takes such an interest in. 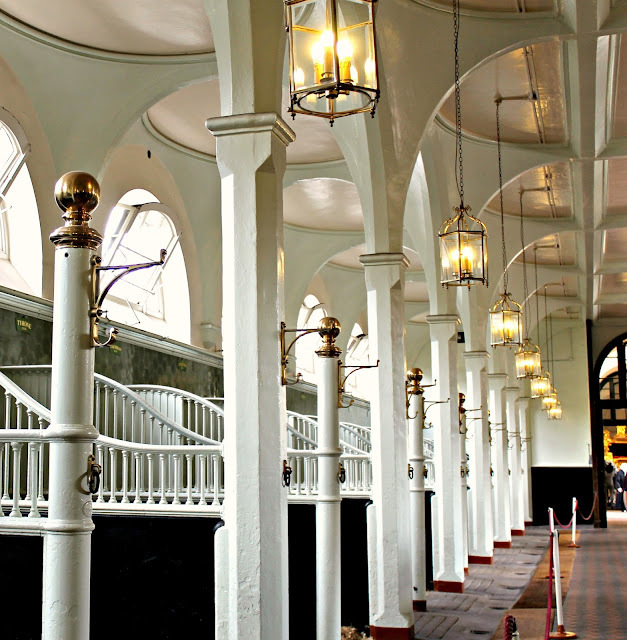 The stables themselves fascinated me. The Queen herself names each of the horses, often based on a favorite location or something special happening at the time the horse is acquired. We even got to see a few of them ourselves. 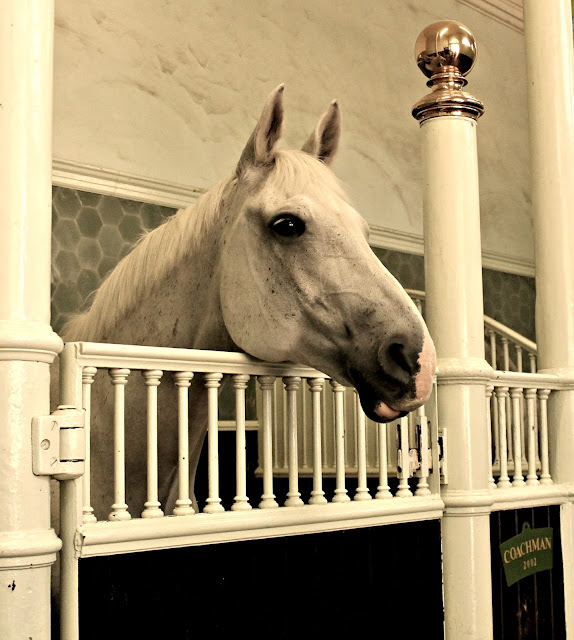 Meet Coachman, everyone. From there, we headed to the State Rooms. These are only open to visitors for a few weeks each year, so I'm so thankful I got the chance to step inside. I'm normally quite understanding and respectful of "no photography" rules. But can I just say my trigger finger was totally itching to sneak a few snaps in there? It was amazing. Not only to see those rooms for myself, but also to hear and learn about the behind the scenes efforts to make parties, state visits, and family milestones a success. But a real highlight and moment of surprise for me came when our tour of the Palace concluded and we stepped into the back garden. 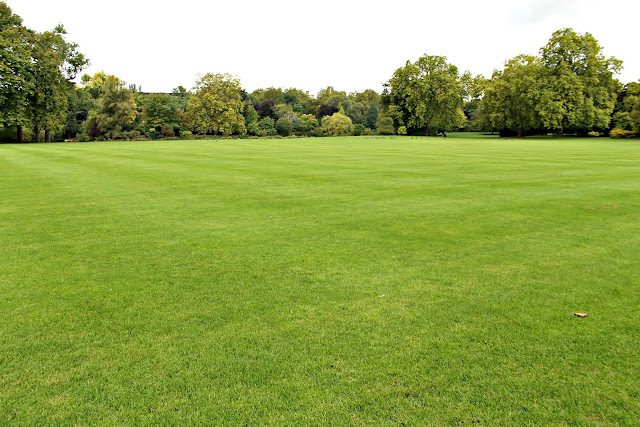 38 acres of private, peaceful green space in the center of London? Absolutely unheard of. I've strolled through St. James Park, played with the kids in Hyde Park, and enjoyed other green pockets in London. But it's hard to imagine having this much land all to yourself in such a condensed city, where even renting an itty bitty studio apartment might cost you a few thousand pounds a month. After a quick lunch in the café in the back garden (as you do), we were off to the Queen's Gallery. 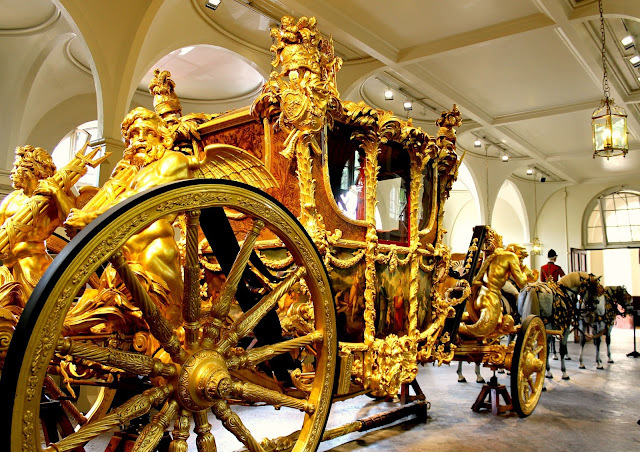 I did my readers a disservice and had no idea what the Queen's Gallery was until I walked in it. Turns out, it's an art gallery where some of the artwork owned by the royal family is displayed, with an often-changing theme. Currently, it's all art based on gardens, which was quite appropriate having basically jogged through the Palace's garden in order to make our timed entrance to the Gallery. 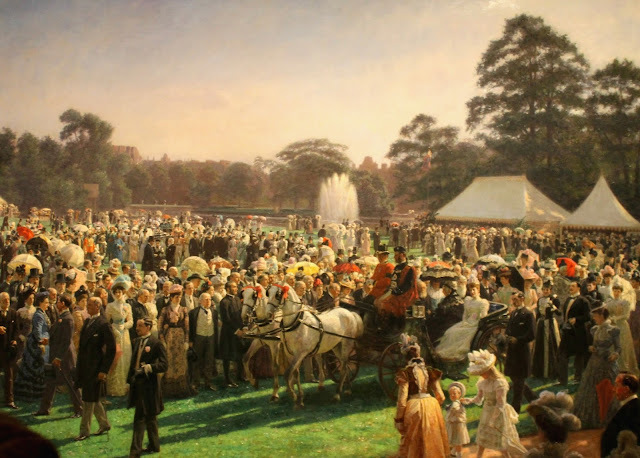 A few favorites here for me included this painting of a garden party (which I've decided is the royal event I'd be most interested in attending, should I ever get the chance). 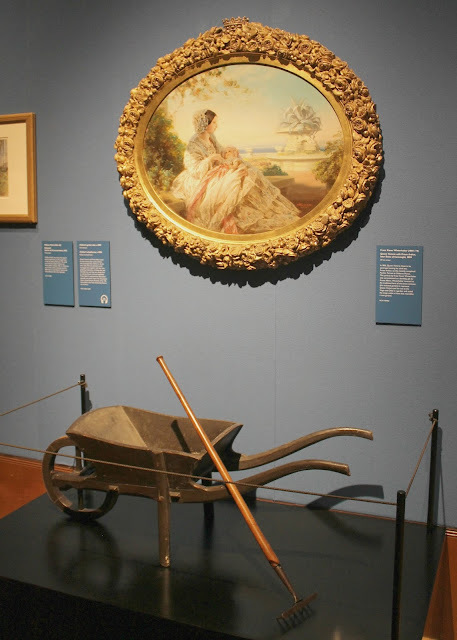 I also loved this painting of Queen Victoria nursing one of her children in the garden, as well as one of her children's toy wheelbarrow and garden hoe that they used when playing outside. Even heirs to the throne need fresh air. Should you have kids with you, be aware that the gallery is quite crowded, even with the timed entrance to manage the flow of visitors. But there is a play room where children can wear period costumes and do art projects at the end of the walk through the various rooms in the gallery. With young children, I would suggest heading directly to that space and then maybe venture out to see a few paintings as moods and patience permit. School age children would be fine to walk through the entire gallery. The gallery is also open nearly year-round. All in all, it was one of those magical days where you feel immersed in another way of life, a glimpse into how "the other half" lives. I'm not quite sure why Americans are so fascinated with the royal family, and I include myself square into that category. Perhaps it's so foreign to us, having never had a monarchy since we broke free of this one. Maybe it's the fairytales of our youth brought into the 21st century. For me personally, there's something about the attention to detail that pulls me in. At my house, it's been a good week if I've swept the floors and scrubbed the toilets. Nine times out of ten you'd find our beds unmade and crumbs on our kitchen chairs. I'm ok with that. But to walk through the Palace and see no fork out of line, no leaf out of place in the garden? That is like stepping into a life so far removed from my own. And why else travel other than to experience a bit of the extraordinary?